Troy Smith said the sandwich both looks and tastes unappetizing. "You were basically getting what you're looking at," he said. 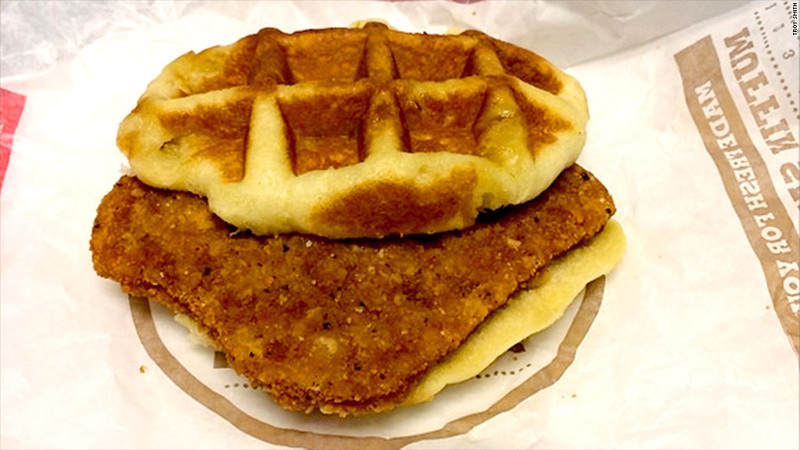 Burger King is testing a Chicken and Waffle Sandwich -- a slab of chicken nestled between two bun-like waffles. Spokeswoman Brooke Scher Mogan said the test is taking place in certain regions and that the company "tests a variety of products." Burger King (BKW) currently has no plans to introduce the sandwich more broadly, she added. Mogan did not provide additional information, including where the tests are taking place. Troy Smith -- a Burger King customer who said he is unaffiliated with the chain -- encountered the sandwich at a restaurant in Pennsylvania. "I love Burger King's regular chicken sandwiches -- they're probably the best ones -- and I love the regular dish, chicken and waffles," he said. But the waffle in the new sandwich was flat and pancake-like, he said, and the chicken appeared to be the regular Burger King chicken patty. "Together, it just didn't work well," he said. "It was missing something -- like the sweetness of the waffle was trying to take the place of the syrup." Smith posted a photo of the sandwich to Instagram, which was then picked up by the food blog Foodbeast. Other recent waffle experiments include the Waffle Taco, a creation of Taco Bell that came filled with fruit, sausage and eggs, or chicken. While the new Burger King creation appears to involve two small waffles, the Taco Bell version involved one waffle folded in half. It's too early to tell if the culinary creation is a hit or a miss.